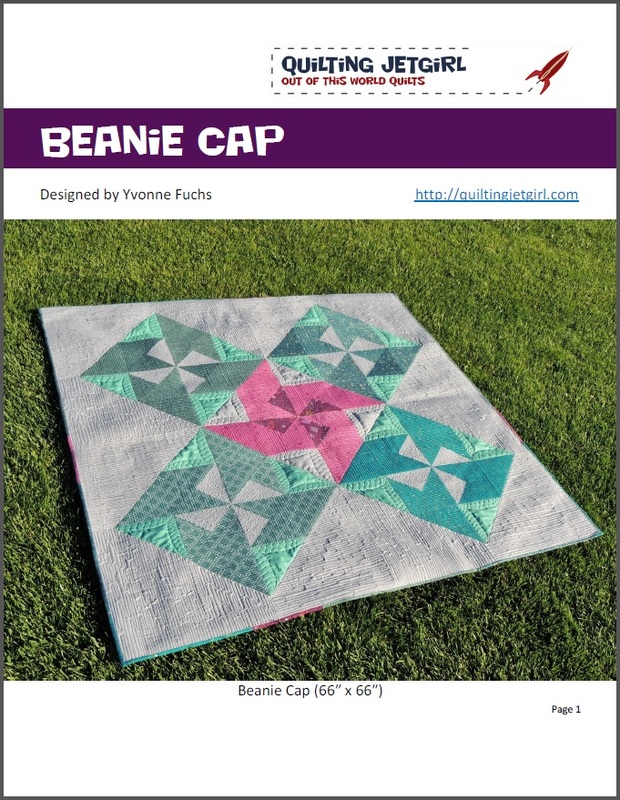 I am so excited to announce the release of my newest pattern, Beanie Cap! The Beanie Cap quilt pattern is currently available for sale in my Craftsy, Etsy, and Payhip stores for $6 through Sunday, July 12th, which is a savings of 33% off of its regular price. To celebrate the pattern release, I have teamed up with Alyssa @Pile O’Fabric to create fabric bundles / quilt kits that are perfect for the Beanie Cap pattern. The bundles are available from Pile O’Fabric while supplies last! The Beanie Cap quilt top finishes out at 66-inches square prior to quilting and washing. I especially like the movement the swirls in each diamond quadrant give the quilt, and I had a lot of fun quilting my test version! 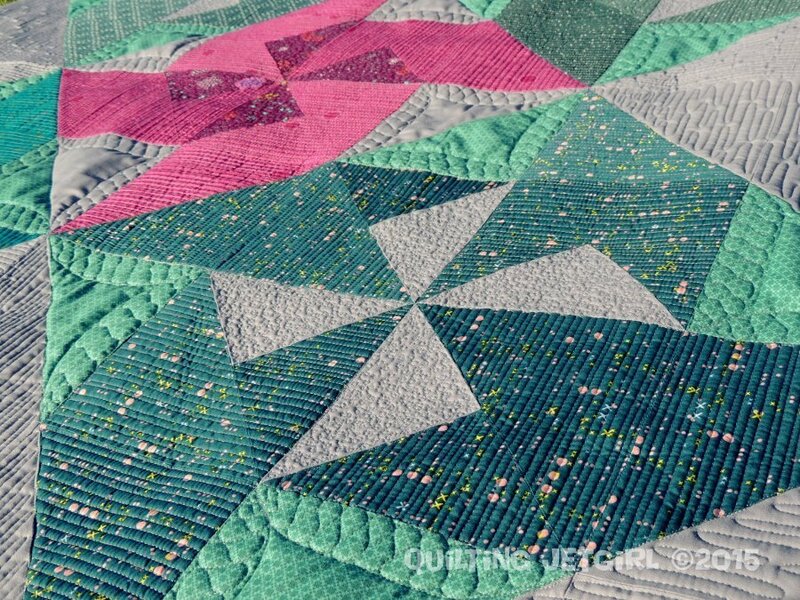 To emphasize the motion of the pattern, I chose to use matchstick quilting and change the direction of the quilting. In the background, I alternated directions as well using long, flowing back and forth lines. For the center pinwheels I quilted a dense meandering loop to give great texture, and in the accent pieces I used an arcing ribbon candy to create fun secondary designs where the patterns meet in the center quadrant. I used 50wt Aurifil #2610 for the piecing and quilting, and I love how the grey blends in to just leave a great texture on the quilt. The quilt pattern comes with a coloring page to help you select your fabric or even doodle you own ideas for quilting patterns! To celebrate the pattern release, Alyssa @Pile O’Fabric is generously offering (1) Colorway #2 bundle as a giveaway, and I will supply the winner with a digital PDF of the quilt pattern! 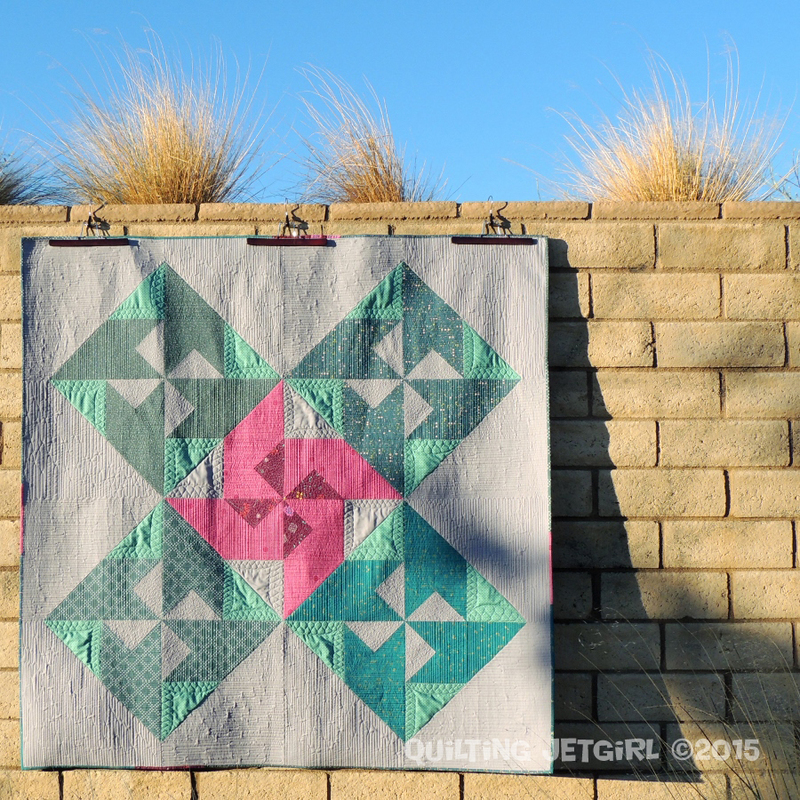 What is your favorite quilting color combination? Old and new followers of Quilting Jetgirl alike: how do you follow my blog (options available on the sidebar to the right: email, Bloglovin’, Feedly, Pinterest, Instagram, Facebook…)? P.S. I always try to respond to comments, but may not be able to on giveaway posts due to the high number of comments. Please know I appreciate your visit and hope you follow or come back again! Linking up to Main Crush Monday, Monday Makers, and Finish it up Friday. 102. I am currently in love with red and aqua combinations. Great pattern and love the quilting. Follower on Instagram -love it! 104. i love using navy, turquoise & white. I think I have 3 quilts with those colors. 106. 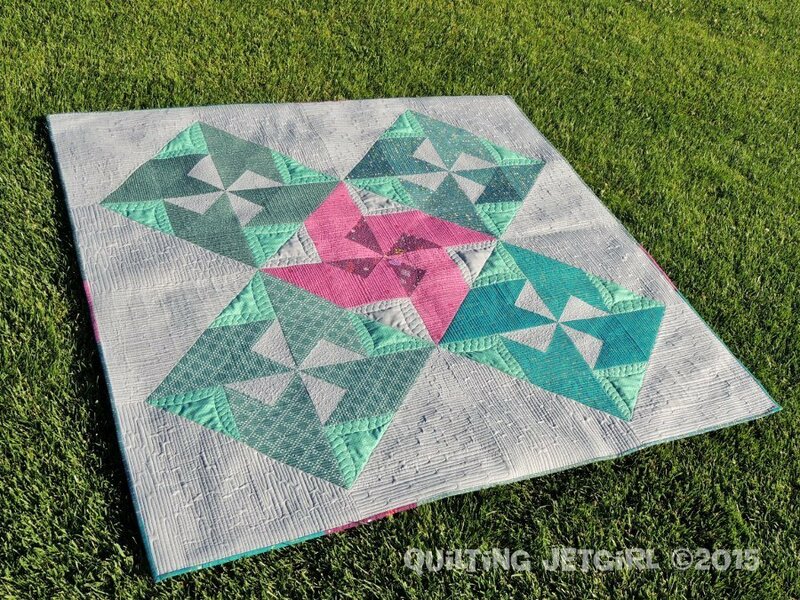 This is such a great design Yvonne (and your quilting is gorgeous!) I love navy, green and citron at the moment! 108. Favorite color combo blue and teal. 112. I follow on Bloglovin!